Since its debut in 1993, Iron Cobra has proven itself as one of the most innovative drum pedals due to its unparalleled functionality, reliability and durability. It is loyally used by numerous drummers world wide. In 2018, to celebrate its 25th anniversary year and to thank the fans continuous support, Tama is releasing the Cobra Bonus Package. 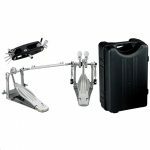 Included in this package is the TMT9R Multi Tool featuring TAMA iconic red finish, allowing drummers to make quick setups and fine adjustment to their equipment.